Intralinks a New York based company, has announced the general availability of its new Intralinks VIA service, and unveiled new brand containers for existing core services in extra-corporate document-based collaboration. Intralinks VIA, in development for nearly two years, is initially positioned to serve "the rest" of the employee population inside customers, which already use Intralinks. 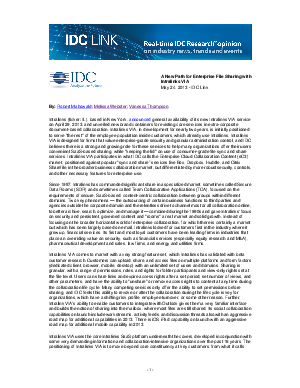 Download this white paper to learn more about the role of Intralinks in the broader business collaboration market, with more robust security, controls, and other necessary features for enterprise use.